This may be the most obviously titled blog post in the history of A Blonde Ambition, but when faced with writer's block, one must sometimes give in to the unoriginal. Creative titles aside though, I'm really in to polka dots and pink coats this week. I'm not saying either of these two things are necessarily 'cutting edge', but I do think they're awfully precious. Got one? No? Well get one. Because if you don't, I will. And I'm a very competitive shopper. I love both of the above equally and fervently. If they're good enough for Olivia P., well they're sure as sugar good enough for me, too. That's all she wrote. Or all I wrote. Or whatever. I absolutely love the first pink coat!! Perfect for a breezy Spring day! I like the outfit with the polka dot top and the red heals! So very cute. i love polka dots!! i used to have a pink trench coat that was the exact color as the first and it was SO much fun! love your posts as always! happy wednesday! I just bought my friends little 1 month old a purple polka dot cardigan! It made me soooo, ridiculously, unnecessarily happy to add that to her wardrobe! I bought a pink coat two years ago from Victoria's Secret and it's my GO TO! I love it and it was on sale...double score! I love all the trendy pink! :)! As much as I hated Olivia on The City, the girl has some style. I love polka dots, and would love a pink coat. Great choices today. What happned to your New Year New You posts? I miss them! I have always been a huge fan of polka dots :) LOVE! Love pink coats! I just saw a pink rain coat at Target that I was tempted to buy! Love that 2nd jacket and the polka dot skirt! Also like Olivia P, but not sure how I feel about that particular dress. I love all of this! It is soooo classy. LOL on the happy little trees. Love that pink coat - I want it! loving the blouse + the sweater! 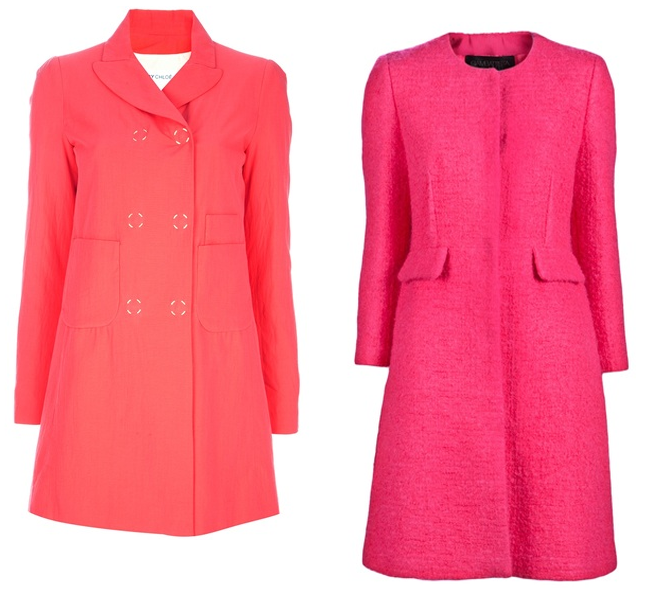 the pink giambattista valli coat is gorgeous!